Move over fidget spinners, there’s a new fad toy on the block. 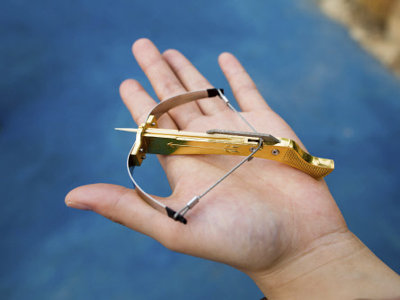 The toothpick crossbow has taken China by storm with hordes of kids flinging toothpicks around classrooms, restaurants, and stores. As the saying goes, it’s all fun and games until someone loses an eye. Which is a legitimate concern considering some kids already have. Lightweight toothpicks are one thing, but launching needles and nails can get dangerous fast when kids are involved. The toothpick crossbows have become so popular in China that the fuzz is actually raiding stores that sell them. Of course, the big fear now is that kids here in the U.S. will put down their fidget spinners in exchange for these toothpick crossbows. Amazon.com has already removed them from their website in anticipation of the upcoming fad and the problems it might create here on the home front.